What a fun day! 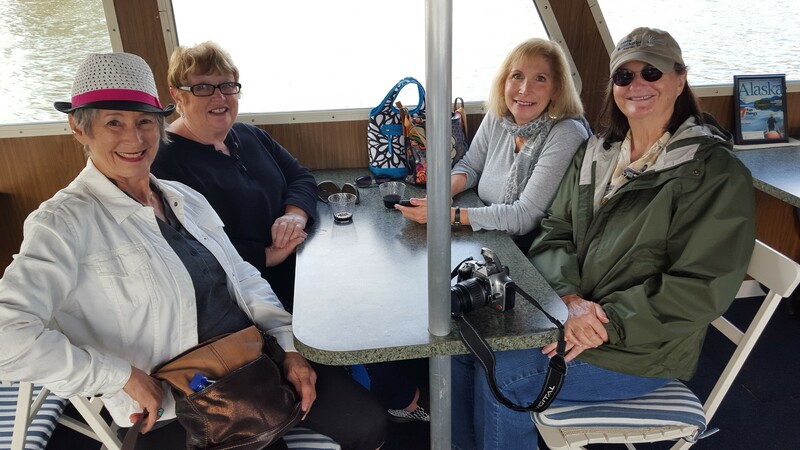 Four of us from Redwood Writers joined the Napa Valley Writers for their cruise of the Napa River on October 17th. The four of us didn’t write a single note, but enjoyed a great day! Thank you, Napa Writers, for the invite! This entry was posted in authors, California Writers Club, poets and tagged authors, California Writers Club, poets. Bookmark the permalink. Great day with my writing buddies! Thank you, Jeannie Jusaitis, for the invitation, and thanks Napa Writers for putting it all together! And a wonderful day it was! We did talk a little writing, and briefly discussed English grammar (as opposed to American) with one of our Napa friends. Of course, we were lucky enough to have the Grammar Diva with us, so we got the right info. Loved the gray watery day and the company. We had so much fun! And no “work” was involved!